You may think the relentless drumbeat to impeach President Trump is a joke. After all, over a year of digging for a crime or even just some dirt has turned up nothing. However, Democrat megalomaniac billionaires (Steyer, Soros and Bloomburg) continue to pour millions into the effort. Leadership in the Democratic party have expressed concern that focusing on the issue could generate an impeachment backlash. 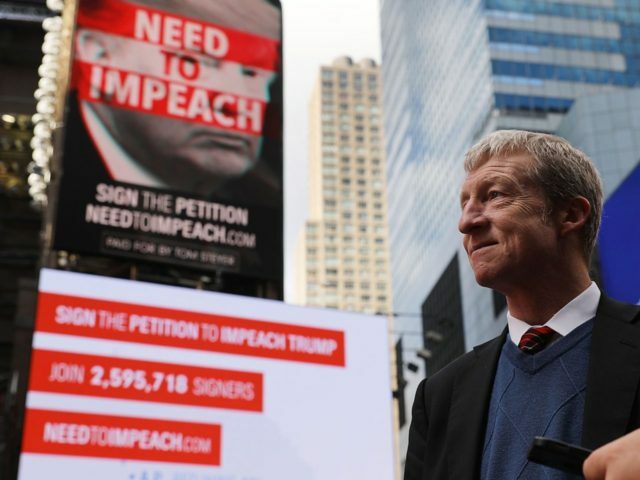 Steyer’s polling of Republicans indicates that: Only 21 percent said they are extremely worried that Democrats would impeach Trump, and 43 percent said they are not worried at all. The question is will the turnout from the dream of impeachment be greater than the Republican and Independent voters, motivated by a strong economy? The Need to Impeach email list alone has already topped 5.5 million, which its research — anyone who signs up with the effort has their information run through a series of voter files and other databases — shows includes a very exact 697,780 infrequent voters in the 63 most competitive House districts. “Our list is bigger than the NRA’s — and we’re going to make sure that it votes that way in 2018,” said Kevin Mack, lead strategist for Need to Impeach. Like poor chess players, the Democrats haven’t thought through what would happen should they be able to retake congress and impeach Trump for simply beating Hillary. The mainsteam media will portray it as a righteous move, while normal Americans will know they witnessed a fundamentally unAmerican action. It’s hard to imagine that there wouldn’t be a huge amount of anger generated by setting such a precedent. How long would it be before every election is followed by a counter impeachment effort? Next Next post: What’s Up With July Borough Minutes?